A new study undertaken by scientists from California State Polytechnic University, the University of Wisconsin and colleagues at Bristol University, has concluded that Smilodon (S. fatalis), kittens were born with strong arms, stronger than similarly-sized modern big cats. However, their pattern of bone development was congruent to other members of the Felidae. The famous “Sabre-Toothed Cat” – Smilodon. Strong kittens – strong cats. Using the extensive Smilodon fossil record preserved at the La Brea Tar Pits (Los Angeles, California), the researchers measured the limb bones of these big cats. Only unbroken limb bones were included in the growth analysis. Fortunately, given the huge number of Smilodon fossil specimens associated with this natural predator trap, the researchers, which included Donald Prothero, the author of “The Princeton Field Guide to Prehistoric Mammals”, that Everything Dinosaur was invited to review earlier this year* had a substantial data set to study. For example, the scientists included thirty, Smilodon upper arm bones (humeri) representing cats at various growth stages in this study. Their ontogenic analysis revealed that young animals had thicker and more robust bones than other members of the cat family (Felidae). The bones did not become more robust as the cats grew, it seems Sabre-Tooths were born with big, strong arms. Comparing the humeri of extinct and extant big cats. The photograph shows a comparison of five big cat upper arm bones (the humerus). The bones come from adult animals and provide a visual guide to the forelimb size of large felids. From the left – the first, whitish bone is the humerus of a Mountain Lion (Cougar) – Puma concolor. The second, whitish bone is the humerus from a Tiger, Panthera tigris. The Tiger is a much bigger and heavier than the Mountain Lion. The bone in the middle is the humerus of Smilodon fatalis, it is much thicker and more substantial. The third whitish bone comes from a Lion Panthera leo. The dark bone on the far right, comes from an extinct species that was contemporaneous with Smilodon. This is the humerus of an American Cave Lion (Panthera atrox), the P. atrox bones used in the study also came from La Brea Tar Pits. How Did the Limb Bones of Smilodon fatalis Change as the Cats Aged? The research team discovered that whilst the arm bones of Smilodon, were more robust than those or extant big cats, they did not become more robust as the cats got older. Smilodon kittens had big limb bones to begin with. Mapping the bone growth (ontogeny), using the many specimens representing animals of different ages from the La Brea fossil collection, the team found that Smilodon grew in a similar way to other, primitive members of the Felidae and in the same way that many living cat species do today. The bones lengthen and become more slender before they thicken. This study, published in the on-line, open access journal PLOS One suggests that Felidae growth and development is much more constrained than previously thought, even in genera with very different morphotypes and bone structures. Comparing the radius of extinct and extant cat species. The photograph (above) shows the radii of the five species of big cat, laid out in the same order as the photograph which showed the humeri. The radius is one of a pair of bones found in the forearm, it is the bone that is lateral to the body (facing the outside). The limb measurements demonstrated that Smilodon fatalis kittens had the same growth curve graph as those of Tiger or Mountain Lion kittens, but they tended to be thicker from the outset. For the same length of bone, the Sabre-Tooth kitten forelimb element (radius or humerus) always had a larger circumference than a comparably sized Mountain Lion or Tiger. Comparing the size of Smilodon leg bones (tibia). The scientific paper: “Did saber-tooth kittens grow up musclebound? A study of postnatal limb bone allometry in felids from the Pleistocene of Rancho La Brea” by Katherine Long, Donald Prothero , Meena Madan, Valerie J. P. Syverson published in PLOS One. A few days ago, Everything Dinosaur sent out their latest newsletter to their customer database. A number of recent product introductions and one eagerly anticipated new model were featured. Linking these two parts of the newsletter was the elephant family (Elephantidae), as the newsletter focused on the beautiful Family Zoo animal models including the fantastic African elephant (Loxodonta) and updated subscribers on the museum quality Steppe Mammoth replica coming into stock (Mammuthus trogontherii). Everything Dinosaur newsletter (mid-September 2017). The Steppe Mammoth replica is in 1:40 scale and it is the first in a new line of museum quality replicas from Eofauna Scientific Research. Everything Dinosaur has been given a degree of exclusive distributorship over the sales of this exciting prehistoric elephant model. A reserve list has been opened which allows model fans to have one of these fantastic figures set aside for them. There is no obligation to purchase, no deposit needed and no requirement to pre-order. Customers know that there is a model allocated to them and one of our dedicated team members will email them to let them know that the model is available should they wish to buy it. The second part of the Everything Dinosaur newsletter focuses on the superb PNSO Family Zoo range of models. Firstly, there is the fantastic collection of ten animals from Asia. These ten figures represent animals that are culturally very important to our species. 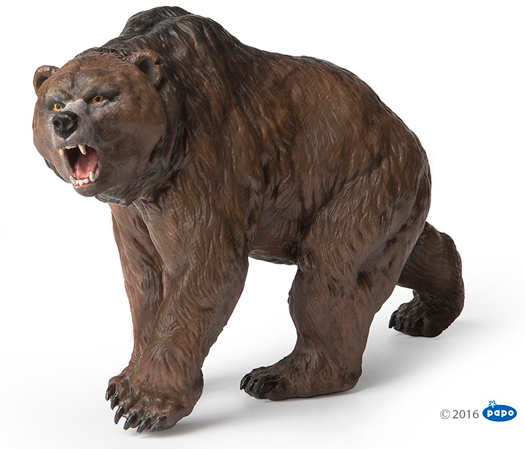 The hand-painted models include pandas, tigers, horses, brown bears, goats, wolves and dogs. This collection is known as the “PNSO Family Zoo Ten Most Popular Asian Animals” and they are extremely hard to obtain. Thankfully, Everything Dinosaur has brought a number of sets over from China, our stock even includes the rare pig model and the Siamese crocodile. PNSO Family Zoo Ten Most Popular Asian Animals. Promoting PNSO Family Zoo Ten Most Poplar Asian and Ten Most Popular African Animals. The second part of the PNSO Family Zoo range features those living creatures regarded as “free spirits”. The models represent ten models of animals from the African Savannah. The “PNSO Family Zoo Ten Most Popular African Animals” includes rhinos, lions, hyenas, cheetahs, zebras, wildebeest and of course a beautiful African elephant model. Naturally, a newsletter from Everything Dinosaur also included dinosaurs, updates on the Rebor 1:35 scale King T. rex as this figure came back into stock, plus highlights of fossil and prehistoric animal news studies that we had covered on our various blogs and social media sites. If you were able to book yourself onto a time-travelling safari to the Cretaceous, before journeying into the long distant past, you might explain to the travel guide that you would be hoping to spot a Tyrannosaur, get up close to a browsing armoured dinosaur or possibly take some photos of Triceratops. However, we suspect, that even if such a venture was possible, few tourists would spare a thought for one group of dinosaurs, that ironically, you would be much more likely to encounter. These are the Ornithopods, that diverse and extremely successful group of bird-hipped dinosaurs, that are often overlooked. A new basal Ornithopod has been named and described this week – Burianosaurus augustai. A plant-eating dinosaur named after the palaeoartist Zdeněk Burian, who, in his lifetime did much to raise the profile of the Dinosauria. An illustration of the basal Ornithopod from the Czech Republic – Burianosaurus augustai. They lacked horns, body armour and for the majority, they did not reach huge sizes, but these herbivores would have made up a significant component of the dinosaur fauna in most Cretaceous ecosystems. If you were to go on a safari to the Maasai Mara of Kenya or the Serengeti of Tanzania, tourists might be keen to spot lions, leopards and elephants but in all likelihood, you would encounter a great many different types of antelope. Dinosaurs like the newly described Burianosaurus can be considered as being the dinosaur equivalent of today’s antelopes. Described from a single, well-preserved, left femur (thigh bone), Burianosaurus is the first dinosaur to be named from fossils found in the Czech Republic. It is not the first dinosaur fossil from the Czech Republic to be scientifically described, that honour goes to a single, broken tooth from an indeterminate Theropod from Upper Jurassic sediments that was described in 2014, coincidentally by the lead author of the paper describing Burianosaurus, Daniel Madzia (Polish Academy of Sciences). Views of the left femur, the only fossil from which the basal Ornithopod Burianosaurus augustai has been described. The photograph (above), shows various views of the left femur of Burianosaurus. This is the holotype fossil (NMP Ob 203), from which this genus was described. It is not common these days, to have a new dinosaur genus erected on the description of a single bone. When this fossil was first studied back in 2005, it was assigned to the iguanodontids. However, over recent years the Iguanodontia and their relatives have been subject to phylogenetic reassessment and many of the taxonomic relationships between different components of the Ornithopoda have been revised. The single bone was preserved in such fantastic condition, that its shape and muscle scars proved crucial in assigning a new dinosaur genus. The views of the femur are (A) a view from the front, (B) viewed from the back, (C) a medial view (the bone viewed from the side closest to the body, think of it as the “inside leg view”) and (D) a lateral view, the bone viewed from the side of the bone towards the outside of the body. Photographs (E) and (F) are views of the bone from the top looking down (proximal) and from the bottom of the bone looking up (distal). The scale bar is 10 centimetres and the white arrow in (A) indicates the site from which a small sample of fossil bone was taken to permit an internal examination of bone structure to take place. This histology helped the research team, writing in the Journal of Systematic Palaeontology, to identify this specimen as coming from a young, adult animal. A lot of work has recently been undertaken in a bid to better understand how different Ornithopods were related to each other. These dinosaurs are characterised by their small, quite triangular heads, large orbits (eye sockets) and relatively primitive dentition (at least when compared to their relatives that comprise the Ankylopollexia clade – more derived Iguanodonts, Camptosaurs and the duck-billed dinosaurs). Their front limbs tended to be much shorter than their hind limbs, so these dinosaurs were probably bipedal, although capable of dropping onto all fours if needed. Burianosaurus has been depicted as being very similar to Hypsilophodon (H. foxii), to which it was related. However, the largest H. foxii thigh bone that we at Everything Dinosaur are aware of, is only about half the size of the holotype of B. augustai. Based on this we estimate that Burianosaurus was around four metres long. An approximate size comparison between Burianosaurus and Hypsilophodon (H. foxii). The genus name honours the famous palaeoartist Zdeněk Burian (1905–1981), whilst the species name refers to the influential palaeontologist and author Josef Augusta (1903 – 1968), who between them, did much to popularise the study of prehistoric animals. Like Burianosaurus, both Burian and Professor Augusta came from the Czech Republic. The single fossil bone that represents this new genus (the thigh bone), was found in the Korycany Beds of the Peruc-Korycany Formation. These are a series of marine deposits laid down in a shallow sea, close to land during the Cenomanian faunal stage of the Late Cretaceous. Team members at Everything Dinosaur estimate that Burianosaurus lived around 95 million years ago. In the scientific paper, the researchers carry out a series of phylogenetic analyses of Ornithopod data and as a result, B. augustai is classified as a basal Ornithopod, however, quite how the Ornithopoda is configured remains open to debate. If you do ever get the chance to participate in a time-travelling safari to the Cretaceous, look out for these fast-running, bipeds, fossils of which are just as valuable to science as that of any other dinosaur. The scientific paper: “A Basal Ornithopod Dinosaur from the Cenomanian of the Czech Republic” by Daniel Madzia, Clint A. Boyd and Martin Mazuch published in the Journal of Systematic Palaeontology. Our thanks to Robert Townsend who set us some more photographs of the prehistoric animal inhabitants of his large dinosaur inspired diorama. This time, the theme is Late Cretaceous Tyrannosaurus and the enthusiastic model maker has created a number of mini scenes featuring “Tyrant Lizard Kings” and their contemporaries. A pair of Tyrannosaurs feeding on the carcass of a Titanosaur. The picture above shows a Wild Safari Prehistoric World T. rex (foreground) with a now retired, Carnegie Collectables special anniversary T. rex replica (background). Titanosaurs did co-exist with Tyrannosaurs, especially in the more southern parts of Laramidia. The Titanosaur Alamosaurus sanjuanensis is known from Upper Cretaceous (Maastrichtian faunal stage) deposits, there is some evidence to suggest that T. rex scavenged carcasses of this huge Sauropod, whether or not they actively hunted these giants remains open to debate. If you look carefully a series of three-toed dinosaur prints can be seen in the photograph, a nice touch from the model maker, adding realism. T. rex mother and baby (feeding time). One of the benefits of building such a large diorama is that various mini-scenes can be incorporated into the bigger scenario. The photograph above shows an adult T. rex feeding a juvenile, one of the Schleich mini dinosaur figures. In the picture below, an armoured dinosaur Euoplocephalus (from the Battat Terra range of figures) battles a T. rex. As the number of detailed prehistoric animal models and replicas have increased, collectors have been keen to find new ways of displaying their collections. Mr Townsend has constructed a substantial three-metre-long landscape that lends itself to a wide variety of scene building concepts representing different parts of the geological record. For example, the Late Cretaceous of North America was the inspiration behind these images and horned dinosaurs made up a substantial portion of the megafauna in this part of the world at the end of the Mesozoic. Robert does not disappoint dinosaur fans as he has included several Ceratopsians in his diorama. It is the attention to detail that elevates this dinosaur diorama, such as the skilfully painted backdrop complete with Pterosaur stickers. The attention to detail is demonstrated in this aerial shot of the landscape, a Tyrannosaur is making its way across the model and its tracks can be clearly made out in the substrate. T. rex footprints in a diorama. 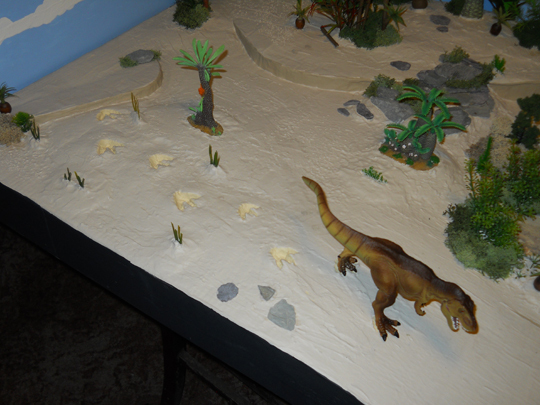 The image (above) also demonstrates the clever use of other props that add authenticity, such as the strategic placement of boulders and the use of various model plants to help represent the flora of the Mesozoic. The Carnegie special edition Tyrannosaurus rex model behind a CollectA Monathesia and Cycad model. In this cleverly composed photograph, it is the model of the prehistoric plants that take centre stage (CollectA Monathesia and Cycads), this model is seen in sharp focus, whilst a Tyrannosaurus rex model is in the background, other prehistoric plants frame the photograph and provide perspective. As part of our on-going commitment to customer service, every one of Everything Dinosaur’s websites have completed the upgrade to HTTPS status. This acronym stands for “Hyper Text Transfer Protocol Secure”, which means that the data sent between your browser and our website as you read this blog post is encrypted. By upgrading from HTTP to HTTPS, were helping to protect your data from any third party that might want to have this information. Although our blog site does not collect personal data, we welcome customer comments and feedback and, as a result, our visitors can be assured that Everything Dinosaur is taking their personal on-line security very seriously. The Everything Dinosaur blog site has HTTPS. Helping to keep visitor data safe and secure. Our TLS (Transport Layer Security protocols), are used to encrypt the transmitted information to secure identities and other personal information in cyberspace. As a general guideline, all websites should have a TLS or, as it is sometimes known, a Secure Sockets Layer (SSL) certificate to ensure data integrity, effective encryption and to support website authentication. Even though this blog site (our dinosaurs for schools site as well), does not collect financial information or personal data of that nature, with the big search engines placing greater emphasis on security, we thought it would be best to convert all our sites to HTTPS, not just or main website: Everything Dinosaur. HTTPS helps avoid nasty surprises. Authentication – HTTPS ensures that users communicate with the intended website, it prevents data hijacking and “middle-man” attacks. When you communicate with us via our websites, be it by leaving comments, placing orders, or by other means, you can be assured that you are communicating with us. Encryption – Safe from unwanted eavesdroppers, when sending data via HTTPS, no-one can “listen in”, data cannot be tracked across multiple pages and information cannot be stolen. Integrity of data – Information cannot be changed, modified or corrupted during the transfer. New security safeguards added to Everything Dinosaur’s website. Search engines in future may notify browsers that they are visiting a site without HTTPS, but you can always check by examining the websites address in the page tool bar. This week sees the publication of a new scientific paper that questions the strictly herbivorous diet of Ornithischian dinosaurs. Writing in the journal “Scientific Reports”, the researchers, which include lead author, Associate Professor Karen Chin, (University of Colorado, Boulder), describe the contents of several coprolites (dinosaur dung), from numerous sites in the Upper Cretaceous Kaiparowits Formation. Turns out that some hefty Late Cretaceous herbivores were tucking into a smorgasbord of rotting wood, insects and crustaceans, despite the fact that when these dinosaurs lived, approximately 75 million-years-ago, this part of Laramidia was a botanist’s paradise. Karen Chin (Department of Geological Sciences and Museum of Natural History, University of Colorado Boulder), searching for coprolite. Direct evidence of the diet of a dinosaur is not usually found, but there is some evidence, plant remains and other matter which is present in the body cavity for example. Then there is the assessment of tooth wear at the microscopic layer, an analysis such as this when compared to the wear patterns on the teeth of extant animals can prove helpful, but most of our knowledge about dinosaur diet has been inferred from studying their fossilised faeces. In this new study, the researchers describe the fossilised faecal matter (coprolites) that indicate a recurring consumption of crustaceans and rotting wood. 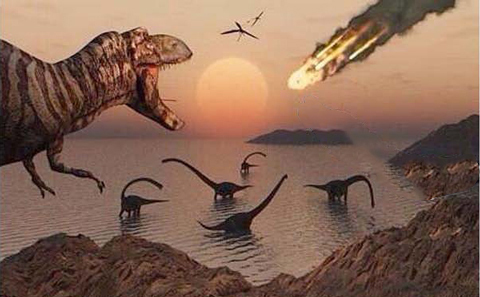 The scientists conclude that this may have been seasonal behaviour, with female duck-billed dinosaurs seeking out additional calcium and protein to help supplement their diets in preparation for egg laying. Many species of avian dinosaur (birds), adopt similar feeding strategies today, deliberately selecting food items that contain calcium, copious quantities of which are needed if the female is going to be able to produce healthy, viable eggs. The black objects represent the exoskeleton of a crustacean within the dinosaur coprolite (scale bar -= 2 mm). In mammals, the calcium taste receptor gene has recently been discovered, the same gene may exist in other Tetrapods – birds for instance. It is also known that taste buds in different species are sometimes co-opted into undertaking different taste functions, so birds and by implication, their extinct close relatives the Dinosauria, might well have had specific calcium detecting sensors on their tongues or elsewhere in their mouths. There is still a lot we don’t know about eggs of living dinosaurs, (birds) and we must be careful not to draw too many conclusions from this fossil evidence. However, this paper supports similar research undertaken previously, when the coprolites of Ornithischian dinosaurs (seventeen fossilised faeces), were studied from the Two Medicine Formation of the United States. The coprolites are similar to those from the Two Medicine Formation, these trace fossils were attributed to the duck-billed dinosaur Maiasaura. The scientists cannot be certain as to what type of dinosaur produced this Kaiparowits Formation dung, there are a number of potential candidates. Several bird-hipped dinosaurs are associated with the various bedding planes of the Kaiparowits Formation from which the coprolites were excavated, but which of these produced the dung, which dinosaur “dung” it? Firstly, the coprolites are large, with some of them having an estimated volume of around ten litres, this rules out a hypsilophodontid, along with the Pachycephalosaur known from this formation. Whichever type of dinosaur produced the dung, it must have possessed multi-toothed dental batteries capable of handling the coarse diet. This probably rules out a Thyreophoran (armoured dinosaur). 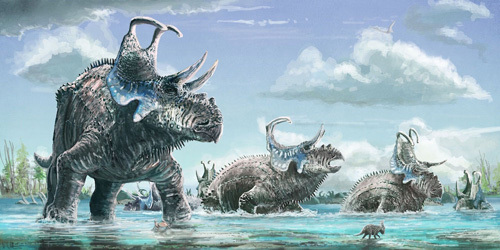 That leaves three described genera of Ceratopsian – there is a Centrosaurine taxa -Nasutoceratops and two representatives of the Chasmosaurinae, namely Kosmoceratops and Utahceratops. However, although both Ceratopsians and duck-billed dinosaurs possessed dental batteries, they chewed food in their mouths in different ways. The scientists studying these coprolites concluded, that their constituents and their similarity to those fossil faeces ascribed to Maiasaura, suggests in all likelihood, that the coprolites were produced by a type of Hadrosaur. Hadrosaurid bones are the most common body fossil associated with the Kaiparowits Formation and two genera are known, the crested Parasaurolophus (Lambeosaurinae) and the Hadrosaurine Gryposaurus. A scale drawing of the duck-billed dinosaur Gryposaurus. The scientists propose that duck-billed dinosaurs actively sought out rotting wood and ingested this material. It would have provided a source of carbon and the fungi helping to break down the cell walls might also have provided additional nutrition. Copious invertebrates would probably have been eaten too. Many of these herbivores would have accidentally ingested small animals such as insects as they consumed leaves and other plants, but at least ten of the fifteen coprolites examined from three different stratigraphic layers, contained fragments of crustacean shells. If these were crabs, the carapace of some of the specimens are several centimetres in diameter. The researchers suggest that these herbivores would have known what they were eating, these fossils can be interpreted as evidence of plant-eating dinosaurs deliberately eating animals. It might be reasonable to infer that these coprolites reflect a seasonal shift in the diet of herbivores, that might have related to the breeding cycle. This interpretation of the fossil evidence provides yet another link between non-avian and avian dinosaurs. A few years ago, we remember seeing fragments of fossilised turtle, stuck between the teeth of a Camarasaurus. At the time, we thought that this was as a result of the depositional process. However, perhaps a pre-gravid Camarasaurus may have picked over the carcass of a turtle in a bid to pick up valuable nutrients. Camarasaurus skull with turtle fossil fragments in the teeth. The scientific paper: “Consumption of Crustaceans by Megaherbivorous Dinosaurs: Dietary flexibility and Dinosaur Life History Strategies” by Karen Chin, Rodney M. Feldmann & Jessica N. Tashman published in the open access journal “Scientific Reports”. The fourth annual Tetrapod zoology conference (TetZooCon), is rapidly approaching and for those of us used to dealing with deep geological time, the 21st October is coming around really fast! Playing host to this Everything Dinosaur supported event, is The Venue, Malet Street, London and this year’s agenda is jam-packed with great speakers and super presentations. The Tetrapod Zoology Conference (October 21st 2017). The organisers have once again provided a rich, diverse and varied range of topics with some notable book signings and a special palaeoart inspired activity that is being kept rather hush-hush for the moment. If you have an interest in biology, animal behaviour, evolutionary history, ecology, conservation and all other matters related to Tetrapods, this conference is well-worth checking out. Tickets are £50 per person for the whole day and booking details can be found here: Further Information and Booking Details for TetZooCon 2017. Renowned palaeoartist, Pterosauria expert and author, Dr Mark Witton will once again be at TetZooCon, attendees will have the opportunity to acquire Dr Witton’s latest book “Recreating an Age of Reptiles”, a publication, Everything Dinosaur was invited to review a few weeks back*. A herd of Machairoceratops dinosaurs making their way to TetZooCon (illustration by Mark Witton). The conference is open to anyone, this not a technical event or one that is only for professionals, if you have a fascination for dinosaurs, enjoy reading about the Earth sciences or an interest in fossils, then TetZooCon is ideal for you. Last year’s event was a sell-out, so a bigger venue “The Venue” has been chosen this year. If you like palaeoart, enjoy learning about how scientific discoveries are interpreted and illustrated, then get yourself booked! One of the event organisers, Darren Naish, will brief conference participants on the latest developments in the world of cryptozoology and another highlight will undoubtedly be Beth Windle’s update on Thylacine research. This is the fourth TetZooCon and it’s going to be bigger and better than ever. Everything Dinosaur has provided a range of great goodies to help support this annual gathering. These will be available as prizes at the end of conference quiz. One of the prizes donated is the amazing “Them – Age of Dinosaurs” with stunning illustrations by Zhao Chuang and text by Yang Yang and Mark Norrell. This hardback book outlines the evolution of life using wonderful artwork and the copy we have donated to TetZooCon is the only one in Europe, as far as we are aware. “Them – Age of Dinosaurs” by Zhao Chaung, Yang Yang and Mark Norrell. Combining scientific research with vivid prehistoric animal dioramas, life in the Mesozoic is revealed in all its spectacular, multi-coloured glory. The illustrations are exquisite and this beautiful book might not be printed anymore, its future publication is in doubt. Attendees at TetZooCon will have the chance to win this amazing prize, along with PNSO Tyrannosaurs and wonderful Rebor models. We have been promised some photos of this year’s activities, presentations and attractions and we are looking forward to posting them up onto our various social media platforms.